This circuit maintains a constant pure-resistive 50-ohm load across the usable frequency spectrum yielding an exceptionally smooth and open sound previously unheard of in a dynamic microphone. The Ball has a built-in swivel mount. the Balls were soon deemed prohibitively cumbersome and impractical due to their shape and size and the limited range of motion of the recessed stand adapter. The Ball excelled at capturing toms, offering excellent definition and sounding spunky and detailed… [it] was less three-dimensional sounding than the Sennheiser e604, but it captured more lows than the SM57 and sounded punchy and bright. SoundOnSound opened up a Blue Ball to see what’s inside. The sound of The Ball can be described as “dynamic mic plus.” It has the punchy characteristics I associate with a good dynamic, but it has fatter lower-mids, solid low end, and a smooth top — it made some of the other dynamics sound thin by comparison. I was reminded of the dynamic microphones of the 1960s that I had previous experience with in recording drums and bass amplifiers. The bottom end was prominent in the upper bass frequencies of 75-125 Hz. This made the bottom end cut through on small speakers systems and created a warmth to the tracks I had recorded on many of the albums I had been involved with. The cavity shape of the four-inch round Ball helped to deliver this very sound. In playing around with an active circuit to equalize or amplify the Capsule we discovered the inputs of most consoles had impedance matching problems with dynamic microphones. By correcting this problem with our own circuit, we stumbled on a presence of sound that took us totally by surprise. We were delighted with not only the bottom end but the detail in the midrange and upper frequencies that led this particular microphone to excel in live PA types of applications as well. 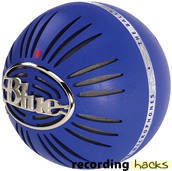 The Blue Microphones Ball is also known as: the-ball.